I just love to see people like this stand up for 34083 Yukon Inc. and encourage people to get the facts. And now Joe Smith thinks the community should follow his wisdom. Doesn’t this guy already have a column or something? There have been many letters submitted to the editor and Smith’s letter gets published. When are the local papers going to act like a reliable news source of what is going on in the Comox Valley? They’re just distributers for flyers passing themselves off as newspapers. Pathetic. The writer must be speaking of someone else as through all the public meetings I have attended and agreements read, there is no indication that the developer has been nothing but forthcoming in both oral and written promises. The writer refers to the self-interest of one group of residents and the gullibility of a petition-signing group saying they are uninterested and easy prey to the promise of a free water treatment facility. This promise has been stated clearly in the original Water Infrastructure Agreement and at public meetings. The writer also did not indicate that it was nearly two-thirds of residents who signed the petition that urged the board to get the deal done. The petition was the result of a board decision to not give the developer an extension of four months needed for ground preparation, bringing in equipment and securing materials from the plant manufacturer. This brought things to a halt. The developer was told he could not speak at UBID meetings. To inform residents he held his own public meeting on March 14 saying he would give his talk and allow for Q & A afterwards. Unfortunately one UBID board member kept interrupting, was politely asked to wait, refused and at one point stormed off towards the exit. In addition at least six times the developer was asked “who would own the water treatment plant”. Six times he answered UBID would own and operate the plant. To me this repeated questioning was nothing more than harassment. As for bullying, I can’t imagine how the developer kept his cool. Letters such as the one I am responding to do nothing more than provide misinformation and promote the divisiveness the writer alludes to. I encourage people to get the facts. All agreements are available on the CVRD website. Outrageous, despicable, a travesty of justice … These are just some of the milder comments I have heard from my fellow residents in Union Bay when describing the recent decision to curtail, once again, the approval of the Kensington Island Properties Development. Unfortunately, there is a handful of people who seem to be working at all costs to stop this development and some of them do not even live in our community. Most recently, the Komoks Band has now decided that they have not been consulted properly. For over three years there have been open meetings inviting the public and others who think they have a vested interest in the project to have their say. It is also my understanding that numerous private meetings have been held with this particular group of people. With all due respect, how can anyone say that they were not given ample opportunity to view the plans, speak their mind or provide input? What has not been made known to the public are the demands that these people have made of the developer in order for them to sign off on a project that is being built essentially on privately owned lands. 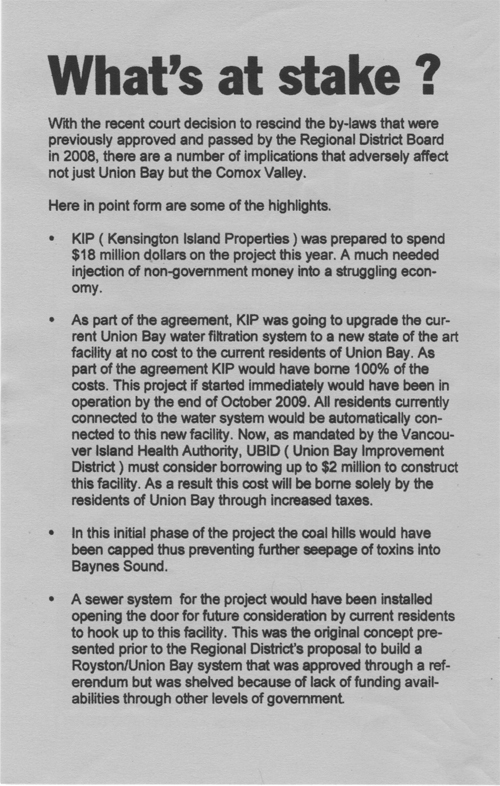 It was recently outlined by the developer to a group of Union Bay residents, myself included, that these demands were numerous and over time would amount to an estimated $100 million. This quite frankly is unrealistic, and to me exceeds the bounds of consultation. Canadians in general and Union Bay residents in particular are consistently respectful and accommodating to the rights of others. There has been much dialogue and debate, ample opportunity within the due process of bringing a project up for public scrutiny. However, it seems that at every turn there is someone or some group who feels that not enough time was given or that their personal agenda has not been met. For the minister to refuse to sign off and allow fourth reading for this much-needed and desired project is, with all due respect, unconscionable. To indicate that the reason for not doing so is because of not enough consultation with certain groups is an egregious error — an error that can have serious ramifications on future development, not just in Union Bay but the Comox Valley as a whole. While the residents of Union Bay make up a small part of the Valley and an even smaller part of B.C., the majority of these residents who want this project to proceed feel that their rights are being infringed upon. What has happened to democracy? What has happened to what is fair? What has happened to common sense? I would urge the minister and all of those other decision-makers to do what is morally, ethically and democratically right. Sign off on the project and let the residents of Union Bay, in concert with the developer, rebuild a community that at one time played a pivotal role in the development of the Comox Valley. As a resident of Union Bay, I attended the Comox Valley Regional District meeting at the Union Bay Community Hall on March 18. The purpose of this public meeting was to hear presentations related to the proposed amendment of a bylaw which would change the land use of a portion of the Kensington Island Properties development. This change would see the use of a portion of the lands known locally as the “Coal Hills” to move from Mixed Use – Commercial – Residential to Golf Course – Residential. Included in the notes to this change was information that would see the capping of the contaminated area, public access to the foreshore with the construction of pedestrian walkways and a boardwalk, plus ongoing measures that would ensure protection of the environment. Also included were references to agreements that have been made with the Ministry of the Environment, Department of Fisheries and the Comox Valley Regional District to use “Best Practices” and “Green Shore” initiatives to protect and enhance the Coal Hills area. This quite frankly is a welcome change, as it would mitigate the continued seepage of toxins into Baynes Sound from these environmental disasters that have plagued the community of Union Bay for decades. It would also reduce and limit the number of buildings in the area versus the original approved bylaw, it would provide for more green space, and would in general create a much more community-friendly development. It was very evident that the majority of the over 100 people who attended the meeting, supported this amendment. What surprised me was the fact that there were several supposedly environmentally conscientious groups and activists who did not support this amendment. I cannot fathom why they would not like to see this area cleaned up using the best technological advances we have available today. I cannot understand why, when we have a private developer willing to pay for this remediation, that they continue to try and raise issues to block this much-needed restoration, and even go on to suggest ideas that in the end would necessitate the use of millions of dollars of public funds. I cannot understand why they continue to not believe the experts, both private and governmental, who have worked diligently to solve these issues. What I did hear was fear-mongering and calls for delay by this small representation. This is unacceptable. Unfortunately, it is these few individuals and groups who grab attention because of their negativity. In my opinion, they are the modern-day version of “Chicken Little,” who, rather than get all the facts, runs off and tries to convince the world the sky is falling. What I don’t see or read in any significant amount are reports about the majority of residents who live in the Baynes Sound-Union Bay area who support what the developer and their community are trying to accomplish. I do not see reports on the amount of work, valued in the millions of dollars, that both the developer and volunteer community groups, such as the local streamkeepers and salmon enhancement folks, have undertaken to restore this sensitive area. Yes, negativity and bad news make for good headlines, but the time has come to take into consideration that the Kensington development in Union Bay is in reality a “good news story,” not just for the local residents and the Comox Valley as a whole, but for the environment. I would encourage all those involved — individuals, special-interest groups, politicians and the media — to take the time, get all the facts, do some research, be fair and give this project the unbiased attention it deserves. “Nearly two thirds of the residents” Not likely. They took only one signature from each property after suddenly showing up at the doorstep. I don’t know how many residents there are but if there are about over 650 hook-ups plus renters there has to be at least 1000 residents. Maybe 40% in favour? The $18 million would be paid as DCCs by anybody building in Union Bay. No exceptions and no credits given. 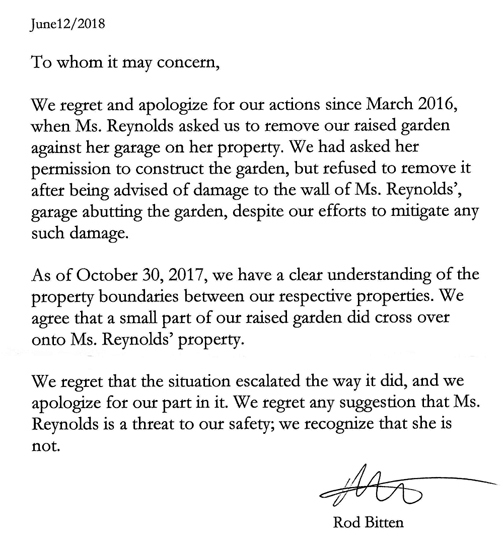 The theory that UBID would not own the facility stems from the fact that it would have been on leased property. Only if and when UBID moved the treatment plant to property UBID owned would UBID truly own the facility.